In December 2013, North Korean ruler Kim Jong Un ordered his uncle executed. Supposedly, Jang Song Thaek had applauded his nephew with too little enthusiasm. That's the core of William Shakespeare's "King Lear" right there, if you substitute exile for execution and the name "Cordelia" for "Jang Song Thaek." A lot of other stuff happens in the play, which opened last weekend at the Guthrie, but in the end it's all about the hurt pride of a demented despot. Cordelia, Lear's youngest child, applauds her father unenthusiastically — or rather, she tells him honestly that she loves him as a daughter ought to love her father, and no more. Lear's other two daughters are only too happy to compete with each other in faux-affectionate excess, praising him as "dearer than eyesight, space, and liberty ... no less than life, with grace, health, beauty, honor," blah, blah, blah. Entering retirement, the king divides his holdings between these two sycophants, and sends poor Cordelia away in empty-handed disgrace. He should have given everything to her. The two elder daughters, Goneril and Regan, are waiting to sink their hooks into their father's hide, and before he knows it he'll be staggering from one to the other, stripped of his power, his dignity and his life's meaning. 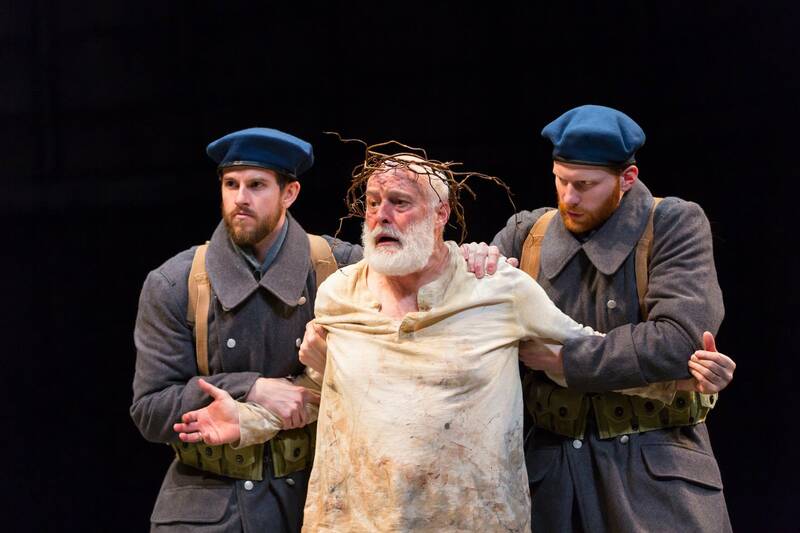 In the Guthrie production, Stephen Yoakam strides the stage so purposefully and delivers Lear's lines so crisply that it's sometimes hard to see the weakness that haunts the king. His "let me not be mad" sounds like a reasoned request, not a cry of dread from a deteriorating mind. But Yoakam's Lear is far from passionless. When his daughters slice casually into his retinue of 100 knights - why do you need more than 50, they ask, or 25, or 10, or five or even one? - Lear answers in a roar: "Oh, reason not the need!" The line is heartbreaking, and it may sound familiar to anyone who's had to tell a proud, aging father that he can no longer have what he wants. Director Joseph Haj has set the play in almost-modern times and sensibilities. Lear's Fool seems to have escaped from the vaudeville stage, and the armies that enter and exit in the later scenes are fashionably mixed-gender. When Sun Mee Chomet, as Regan, mutilates poor old Gloucester, we wonder how the costume crew will ever get the vile jelly stains out of that clingy satin number she's wearing. A menacing, sometimes throbbing soundtrack creates a distinctly cinematic atmosphere. Strong actors deliver solidly in this production. Armin Shimerman plays the Fool with an unusual grimness, but it works. Chomet's Regan and Kate Nowlin's Goneril are portraits in feral ambition under a thin veneer of civilization. J.C. Cutler gives the faithful Kent a big heart that pumps loyalty as much as blood, and his aerobic dressing-down of Kris Nelson's Oswald ("A plague upon your epileptic visage") is a highlight of the show. Haj's interesting choice to double-cast the role of Lear, though, leaves me feeling that I've seen only half the production. I'm hoping to go again to catch Nathaniel Fuller's performance and see how his choices might differ from Yoakam's. Ultimately, though, the choices that count are those Shakespeare made. He sends this wounded lion of a man out on a storm-blasted heath and brings him face to face with a crazed, broken beggar. "Hast thou given all to thy two daughters?" Lear asks. "And art thou come to this?" This is a devastating piece of theater, and a production that does it justice.